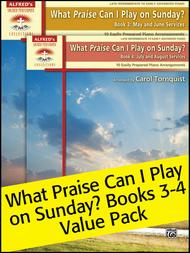 What Praise Can I Play on Sunday?, Books 3-4 Value Pack arranged by Carol Tornquist. For Piano. Other; Promotional Packet; Solo. Sacred Performer Collections. Ascension; Contemporary Christian; Father's Day; Mother's Day; Pentecost; Sacred; Spring; Summer; Trinity Sunday. Early Advanced; Late Intermediate. Published by Alfred Music (AP.105675).This Value Pack includes What Praise Can I Play on Sunday Books 3 and 4. It is a series of six books of worship favorites, each book designed for busy pianists who require accessible arrangements. Book 3 contains selections for holidays and holy days that occur during May and June, including Mother's Day, Ascension, Father's Day, Pentecost, and Trinity Sunday. It also contains several general praise songs. Book 4 contains selections for the Fourth of July as well as several general praise songs.About Sacred Performer CollectionsAlfred's Sacred Performer Series offers church musicians a great source of beautiful piano arrangements of both traditional and contemporary sacred literature, ideal for use in general, seasonal, and special services such as weddings and funerals.